Dark Horse Comics teams up with a wilderness training organization to offer the best summer ever. When I was young, the most fun I had at summer camp was getting eaten by mosquitoes and canoeing around a small lake. Nowadays, kids not only get to hike around in the woods and sleep under the stars, but also learn to speak with the dead and fight off otherworldly monstrosities in a new summer camp introduced by Dark Horse Comics and wilderness training organization Tracker Earth. 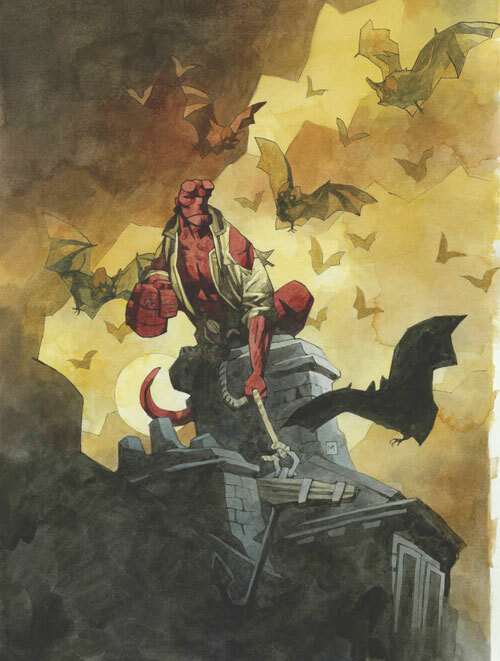 Called the Bureau for Paranormal Research and Defense (BPRD) Training Camp, this Hellboy-inspired program for children ages 9-17 offers to immerse attendees "in tactical training of all forms, including survival skills in any environment (both earthly and non), martial arts and self-defense specific to praeternatural entities." The week-long camp also offers basic courses in "hand to hand weaponry," (though with foam swords and the like) along training in forensic investigation, mythology, and the chance to meet series creator Mike Mignola himself. Older campers will be able to spend a few nights at Camp Trackers in Sandy, Oregon to participate in some other-worldly investigations of their own in the nearby abandoned town of Marmot. They'll also get to delve into the real-life legend of homesteader Adolph Aschoff who supposedly "sealed away an ancient evil" when Marmot was originally founded, though in reality Aschoff's life was not quite as exciting. Full details of the camp can be found here, and its prices are roughly $300 USD for kids 9 to 10 and $400 for the 11 to 17 age group. The camp also offers 'zombie apocalyse' survival courses along with other kinds of wilderness training, so if you want to be the coolest parent (or aunt, uncle, older sibling, etc.) in existence, start saving up now. Then join me in lamenting that we're not a a decade or two younger.